The Police have told musician Oladapo Olabanji (Dbanj) to make a formal report on the circumstances that led to the death of his son. The singer's son Daniel III, who turned one year in May, drowned in a pool on Sunday at the couple's Ikoyi residence in Lagos. He was one year-old in May. The toddler's remains had been moved to a morgue at GRA, Ikeja. Dbanj who was in the United States when the accident happened wrote: "Trying Times. But my God is Always and Forever Faithful." Lagos State Commissioner of Police, Mr Edgal Imohimi, said on Monday that the family should report the incident to the police after the period of mourning. In a statement signed by the command's spokesman CSP Chike Oti, the commissioner of police said the state command had sent a delegation to condole with the family. "The CP wants the family to know that at this period of their grief, the entire command shares in their pains. "It is expected that when the mourning period is over, the family will formally report the circumstances that led to the unfortunate death of the little Daniel to the police," Imohimi said. 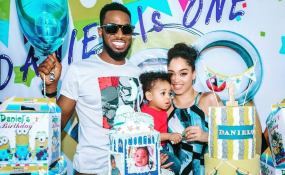 Meanwhile, condolence messages have been pouring in for Dbanj and his wife, Lineo Didi Kilgrow, over the death of their son. Senate President Bukola Saraki in a tweet wrote: "Dapo 'D'Banj' Oyebanjo, accept my heartfelt condolences on your loss. "May the Almighty comfort you and your family at this trying time." Expressing shock at the toddler's death, Tiwa Savage wrote, "I was just holding you last month celebrating your birthday. "I am in shock, my heart is broken. This is unbearable." Davido who bagged BETaward Best International Artist paid his condolence in his acceptance speech. Cool DJ Jimmy Jatt‏ wrote : Stay strong dbanj, using a black square image to drive home his sympathy. Peter Okoye (PSquare) said: Heartfelt condolences to Dbanj and his family. Words can never be enough. Stay strong. Toyin Saraki, wife of Nigeria's Senate President also joined in the outpouring of sympathy: "Heartbreaking. May Almighty God be with ‪@iambangalee Dbanj and his wife at this tragic time and always. May their beautiful little one rest in peace. Amen." Producer Don Jazzy wrote, "Just heard the worst news in a long time." Lami Apejoye, PR Girl, comforted the couple saying: DiDi has always been a strong woman, God will see her through this one too, this too shall pass!! And Dbanj, Joy will definitely come again! Soon! Sighhhh! I'm stressed!!! God keep the family! In his condolence message, Bank W wrote, "Sending prayers up for @iambangalee, his wife and their entire family. "This is a nightmare. Heart wrenching news. May God strengthen and comfort y'all in this absolutely terrible time in Jesus name."